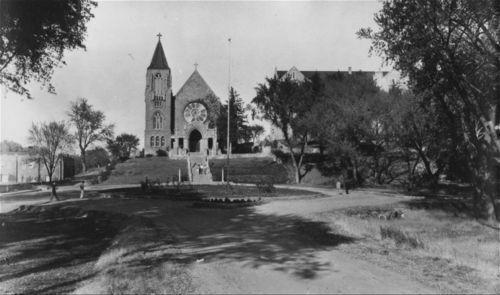 This black and white photograph shows the native limestone structure of the Immaculate Church on the grounds of the St. Mary's Academy and College. The beautiful Gothic church with its magnificent stain glass windows was a place of worship for students who attended the private men's college. From 1931 to 1967, at least 1,000 theological students were ordained as Priests within the walls of the Immaculate. In 1978, two accidental fires destroyed the church leaving only the exterior walls standing.